The upper abdominal vessels are important for several disease states and as landmarks for a few abdominal structures. The abdominal aorta is important because it may become aneurysmal. This exam is usually done as the first part of the liver, gallbladder, bile duct, and pancreas exam but this chapter focuses just on the blood vessels. Do this exam with the patient at 30 degrees elevation and in the left lateral position to optimize the acoustic liver window and to shift the stomach contents away from the epigastrium. Deep inspiration can also improve the view by moving the liver caudad. It may be necessary to scan as much as possible through the liver window with caudal fanning of the probe. Be sure to get the probe midline and perpendicular or the anatomy relationships will appear altered. The images shown below were from lean patients with excellent views. It is important to learn this anatomy with patients with good views so that the most important features can be identified in patients with more compromised views. Use the curvilinear probe, abdominal mode, transverse position at the top of the epigastrium (indicator examiner left) and the left liver lobe will be anterior on the screen. Use enough depth to show only a small amount of the the vertebral shadow. The AA will be just anterior to the vertebrae and slightly to the patient’s left. If the AA is positioned differently, adjust the probe to bring it to the correct orientation. The inferior vena cava (IVC) will be slightly to the patient’s right at this level. The following clip shows correct orientation with the expected difference in pulsation between the IVC and AA. The IVC is normally crescent shaped and color flow Doppler (CF) may help show the normal double pulse compared with the single pulse of the AA. This transverse view of the IVC is optimal for seeing collapsibility with inspiration. A rounded IVC, as in the following clip, almost always means elevated right atrial pressure and the IVC will rarely collapse very much. Slightly caudad in the epigastrium, the transverse left portal vein (PV) with its hyperechoic walls may appear in the left liver lobe. Posterior to the liver and anterior to the IVC the extrahepatic PV (sometimes without a hyperechoic casing) may be seen, as in the following image. The emphasis is that the PV is always anterior to the IVC. A reference anatomy picture is needed for the next group of vessels. It is not as complex as a first glance may indicate because many vessels are labeled proximally and distally. It doesn’t take many repetitions of this exam to learn the relationship of the handful of vessels that really matter. The first structure further caudad is the celiac artery (CA), arising from the anterior wall of the aorta. The following clip shows the “seagull wings” of the CA with the splenic artery (SpA) flowing to the patient’s left and the common hepatic artery (CHA) to the right. About 1 cm caudad from the CA, several vessels appear very close together and often almost simultaneously. The superior mesenteric artery (SmA) takes off from the anterior aorta and runs obliquely caudad and medial. Because of encasing tissue, it has a thick hyperechoic wall that can make it look like an old-fashioned “mantle clock” sitting on top of the AA. Here is a nice SmA on top of the AA. Almost immediately caudad from the SmA takeoff, the left renal vein (LRV) comes up and over the aorta to join the IVC. It flows right under the SmA where it is usually thin and pinched with a more dilated section right before the SmA. Here is a good, normal LRV. The right renal vein enters the IVC on the right lateral side, but is harder to see without angling over to the right. Immediately caudad of the LRV crossing, the very important splenic vein (SpV) comes from the left over the SmA and joins the superior mesenteric vein (SmV) flowing cephalad from the abdomen. This merger is the beginning of the PV. The SpV is critical to identifying the pancreas, as discussed in a future chapter. In the next image the SpV is seen and the LRV is fading just a little from view. Caudad from the SpV, any vein seen anterior to the IVC will be the SmV. Renal arteries exit the AA just caudad to the SmA but are often indistinct. The right renal artery runs just posterior to the IVC and the left renal artery runs just posterior to the LRV. Our views of the renal arteries are rarely good enough to diagnose renal artery stenosis. In the next clip the LRV and the SpV appear and disappear and each renal artery can be briefly seen. Here is a magnified clip of the same patient. The “sandwich” of the SpV, SmA, and LRV is the key thing to identify. Finally, here is a clip is from another patient in whom the SmA, LRV, SpV, right renal artery (and perhaps left) could be seen. The right renal vein can probably be seen briefly as it joins the IVC on the right lateral side. IMBUS screening for abdominal aortic aneurysm (AAA) is low cost and easy to justify at least once in all patients over 65. However, the current national screening guidelines restrict formal radiology screening to current or former smokers, particularly males, from a cost effectiveness standpoint. 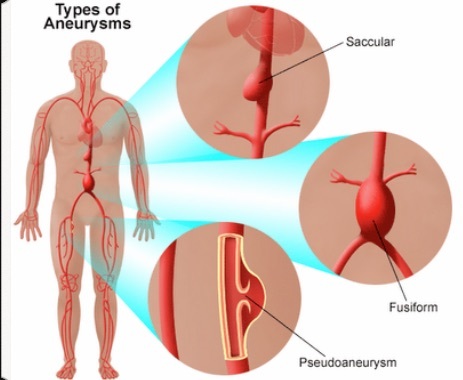 Aneurysms of the AA are rare down to the level of the renal arteries and would really stand out compared to the other vessels. The serious search for AAA is below the renal arteries. The AA varies in size based on patient height, but in general, aneurysm is defined as being greater than 3 cm in greatest diameter. However, the worry point doesn’t come until a AAA is over 4 cm and intervention takes place around 5 cm. While the longitudinal view of the AA can help find some difficult AA, the standards for measuring the AA are for transverse views. In particular, the transverse view helps avoid missing the unusual saccular aneurysm. Always optimize the depth, sector width, focus position, and magnification for the AA. AA measurement: Obesity and bowel gas create challenges. Substantial probe pressure is usually needed to move gas out of the way and reduce the distance from the probe to the AA. Tell patients that probe pressure is needed and ask them to indicate when the pressure is too uncomfortable. The exam can be done in the left lateral position or in the supine position, which ever gives the best imaging. 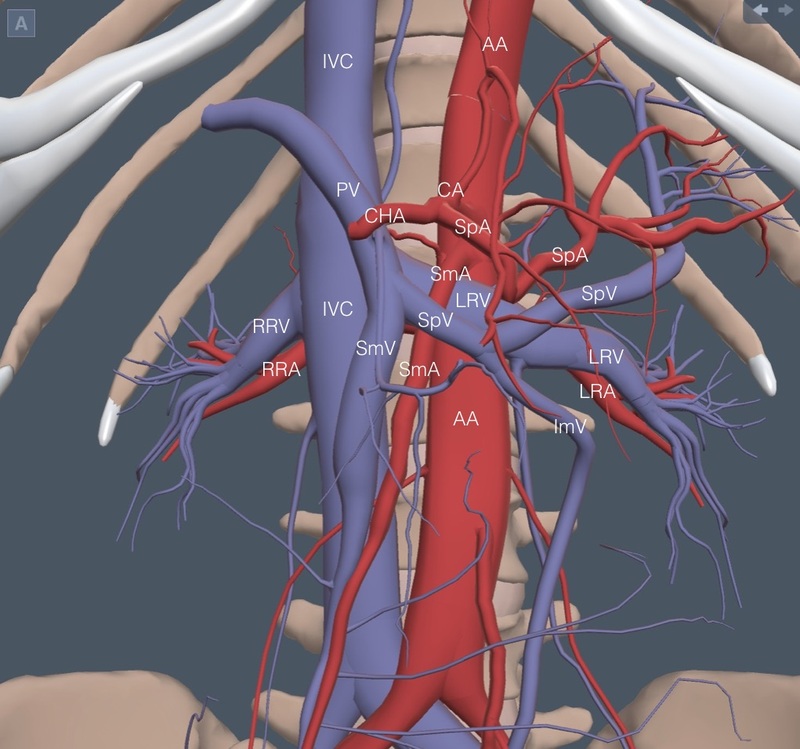 Follow and periodically measure the AA from the SmA down to where it bifurcates into the iliac arteries. Isolated iliac artery aneurysms (diameter > 1.5 cm) are rare, but such aneurysms are common in association with distal AAA. The AA may be intermittently lost because of overlying bowel gas, but if periodic good measurements are obtained, the gaps are acceptable. The measurement of the AA that matters is the greatest diameter, wherever it occurs. Clinic imaging is not gated with the ECG and the AA can vary in diameter from 0.2 to 0.4 cm between systole and diastole so be cautious interpreting small changes in AA measurements over time. Get repeated measurements in any patient if the diameter is borderline or high. There are two issues with the measurement technique. The first is that the probe needs to be perpendicular to the aorta or falsely high values may result. It may be harder to get perpendicular as a AAA gets larger. Check that the probe looks perpendicular to the body long axis with any increased AA measurement. Usually, the most perpendicular view also gives the clearest image of the AA. Repeated measurement should be performed with any large AA. The second issue concerns the method of measuring across the AA and there are two parts to this issue. 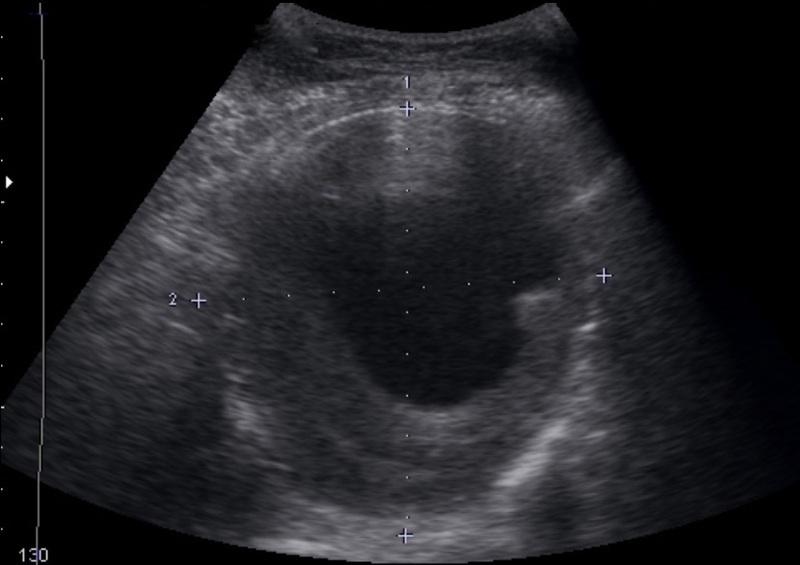 An ultrasound physics principle called the “blooming effect” causes over-estimation of vessel wall thickness in transverse view. More accurate results for the AA are thought to result from the “leading edge to leading edge” (LELE) method, in which the first cursor placement is at the beginning of the hyperechoic anterior wall of the AA and the second cursor is placed at the beginning of the hyperechoic posterior wall. Here is a typical, normal AA measured with LELE. This is different from a commonly taught method of “outer to outer” measurement. Many labs don’t specify the method they use, but our template for AA documentation includes the LELE method. A related issue concerns the presence of thrombus in the lumen as a AAA gets larger. The diameter of the aorta can be underestimated if we put the posterior cursor at the beginning of the thrombus, rather than at the beginning of the posterior wall. Here is a clip of a moderate sized AAA that had thrombus both anteriorly and posteriorly. Measuring just the lumen gives a falsely low number, but, there is also danger of a falsely low measurement with the LELE method if the posterior cursor is put at the beginning of the posterior thrombus. 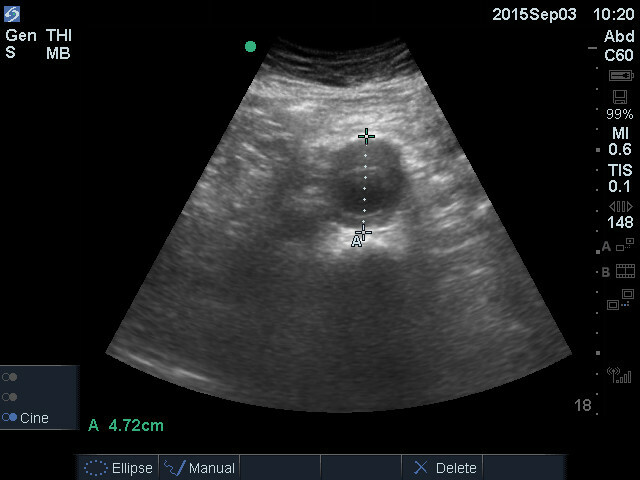 Below is the actual measurement taken (4.7 cm) of this AAA, which was well done with the posterior cursor placed beyond the thrombus at the echogenic start of the posterior wall. This measurement agreed with a subsequent CT measurement. Ideally, we should have magnified this AA before using the calipers. Here is a huge AAA, measuring almost 10 cm in greatest dimension. There is certainly a large amount of thrombus. 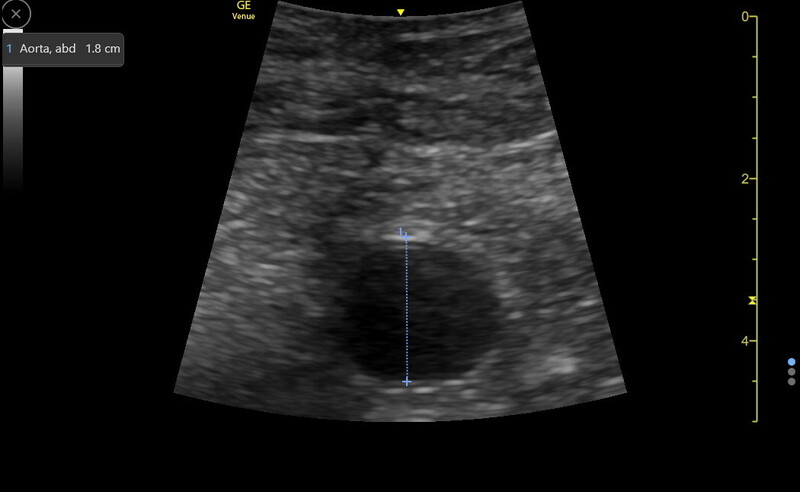 The transverse diameter of most AA is more uncertain than the anterior/posterior because the ultrasound beam is not perpendicular to the lateral walls. But, in a patient like this, parts of a cm don’t matter; this patient urgently needed a repair procedure.